Thunderbolt™ to eSATA + USB 3.0 Adapter extends the use of your existing eSATA-equipped external storage unit. Thunderbolt™ to eSATA adds SuperSpeed USB 3.0. Extend the use of your existing eSATA-equipped external storage unit by connecting it to your Mac. Since many users are still on eSATA equipment this adapter will add value by adding USB 3.0 support. Conveniently, the Kanex Thunderbolt to eSATA adapter adds an extra SuperSpeed USB 3.0 port to your Mac or PC computer so users can connect to more everyday peripherals, like external hard drives, a keyboard or mouse. Kanex Thunderbolt adapters won the Macworld Best of Show 2014 award for their ability to help Mac or PC users increase their connectivity options and bridge the gap between old and new technologies. Set-up is easy. 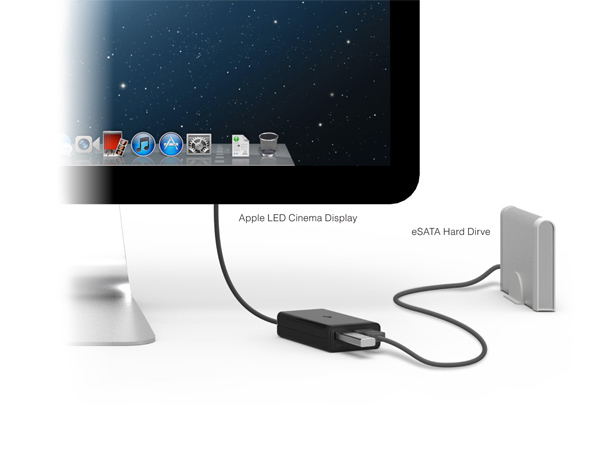 Simply connect an eSATA hard drive to the Kanex Thunderbolt adapter, and then plug into the Thunderbolt port of your Mac or PC. Use the extra USB port to connect extra peripherals. For even greater expandability, add the Kanex 4-port USB 3.0 hub and access up to 4 USB 3.0 devices at the same time. New Mac computers beyond 2011 have USB 3.0 built in already, but this product can still be used to expand your needs. It is simple, portable and easy to use.